3 R. Williams, op. cit. n. 1, p. 4-31. 1«Christianity is not one of the great things of history; history is one of the great things of Christianity.» This arresting paradox, coined by the French Jesuit theologian, Henri de Lubac (1896-1991) crisply articulates the essential nature of Christianity as an historical religion1. With the Reformation, however, as the work of scholars such as Pontien Polman and, more recently, Irene Backus have eloquently demonstrated, the stakes were significantly raised2. To adapt the words of Rowan Williams: to relate the story of the Christian Church – particularly for Christians – is to look for a «plot» in the historical record3. For the Protestant Flacius Illyricus this «plot» took the form of a narrative which depicted the True Church’s hijacking by a corrupting papacy and of the former’s heroic struggle in adversity as testified through the centuries by an unbroken chain of witnesses to the truth – a veritable catalogus testium veritatis. For the Catholic Cesare Baronio, on the other hand, the essentially unchanging essence of the true Apostolic Church as embodied by the Sancta romana ecclesia was reflected in an unbroken continuity of doctrine and devotional practice from Apostolic purity to the present – semper eadem. Whichever master narrative was being championed, an awareness of the past’s power to legitimise (or polemically undermine) was dramatically accentuated. It is against this background that the following chapter should be understood: for all the historical protagonists whose ideas and opinions are discussed below the past was a vital, contested resource; an arsenal for the defence or justification of their position and the grounds for attack on their enemies. Moreover, here historical narratives were being used not to conduct inter-confessional rivalries, but to take positions in intra-confessional disputes. The case in question – the bitter rivalry between the spirituali and zelanti in the upper echelons of the hierarchy of the Roman Catholic Church as a determining influence on the interpretation of what constituted true and legitimate reform in the years running up to and including the Council of Trent (1545-63) – is a particularly powerful instance of this process, as we shall see. 2For a supposed «non-event», the Italian reformation has generated a not inconsiderable body of secondary literature, as John Tedeschi’s monumental bibliography of over 6,400 titles, of which no fewer than 1,263 were published between 1975 and 1997, clearly demonstrates4. In addition, since 1978, the topic has attracted the writing of several excellent historiographical surveys directed towards particular themes which have done much to clarify problematic issues. I am thinking, in particular, of those on Evangelism by Elisabeth Gleason and Susanna Peyronel; that on periodisation by Anne J. Schutte and, most recently, that tour de force of compression and good sense on the Italian historiography of the Reformation in Italy 1975-1997 by Guido dall’Olio, (to whom (incidentally) I owe the above figure of the number of more recent publications)5. What follows does not seek to revise or even recapitulate what they have already written. Instead, in the spirit of constructive engagement, I will attempt to use and build upon their insights to question the questions my colleague, Mark Greengrass and myself have been requested to answer from our respective areas of geographical expertise, in order to provide what I hope will be a helpfully suggestive agenda for future research. 6 G. Dall’Olio, op. cit. n.5, p.50. 3The first question put to us by the organisers of this conference was: «What innovations did those touched by evangelical ideas seek to introduce?» I shall spend a disproportionate time on this first question since from it stem the problems I have with all the other questions. The main issue here, it seems to me, is that which has already been raised and dissected with scholarly aplomb by Susanna Peyronel in her fine article of 1982. That is to say, the degree to which «evangelismo» is a retrospective construction – whether in the form of Imbart de la Tour’s vision of it as an Erasmian «third way» or Paolo Simoncelli’s view of it as nicodemism-in-waiting (and all stations in between). In other words, the central problem of this paradigm is that it tends to flatten and homogenise the diverse spiritual agendas of the likes of Gian Matteo Giberti, Gasparo Contarini, Reginald Pole, Giovanni Morone, Pietro Carnesecchi, Bernardino Ochino, Pier Paolo Vergerio and Juan de Valdés, when the only common thread linking many of them was the fact that, at one time or another, they attracted the attention of the Holy Office under the relentlessly and mercilessly probing eye of Gian Pietro Carafa6. 8 Vol. 71, p. 5-20. 4The use (and misuse) of the term «evangelismo» to give these diverse reactions to Protestant ideas a false coherence has been replaced by emphasis on the experimental and protean nature of religious innovations in the period 1500-1550ca. Silvana Seidel Menchi’s magisterial study of 1987, Erasmo in Italia, for example, introduced into the debate the suggestive term «teologia del quotidiano»7. This described a preoccupation with concrete issues relating to daily devotional practice, such as confession and worship rather than abstract doctrinal precepts. By shifting the focus on contemporaries’ preoccupation with practice rather than precept – on theology in action/theology as a verb rather than a noun, Seidel Menchi helped integrate further the fundamental contribution made by Anne Schutte in her 1983 work on printed Italian vernacular religious books, whose findings had been anticipated in an important article Printing, piety and the People of Italy: the first thirty years in Archiv für Reformationsgeschichte of 19808. Schutte’s focus on this earlier period – the appendix to this article lists Italian religious «best-sellers» published between 1465 and 1494 – points to the importance of remembering that the Italian peninsula pre-Luther was not a Sleeping Beauty awaiting her Prince9. Moreover, the work of Schutte and others in the burgeoning field of the history of the book – I am thinking in particular of the very useful collection of essays edited by Jean François Gilmont in 1990 – has enabled us to appreciate not only the range of protestant titles which were available in Italian translation, but also just how relatively widespread was their diffusion within Italy10. In addition, the careful and deeply meditated scholarship of Barry Collett has recovered for the historian’s attention a phenomenon which had previously been largely ignored: the supreme relevance of the Benedictine Cassinense Congregation’s view of grace and works, gained from the study of the Antiochene Fathers of the Early Church, such as Basil of Cesarea and John Chrysostom, for squaring the theological circle; by reconciling justification by faith alone with an orthodox sacramental and devotional context11. The almost entirely successful destruction of all copies of the Beneficio di Cristo, first published in 1543, which had been co-authored by the Congregation’s Benedetto da Mantova, combined with the abject failure of their theologian representatives at Trent to make any impact on proceedings, should not let us undervalue the remarkable achievement of this tantalising «what if?» of Reformation history. 5All this has contributed, in turn, to a reassertion of the independence, originality and creativity of Italian ideas of reform, at least for the crucial decades 1530-50, which Massimo Firpo and others prefer to describe under the label of «Valdesianesimo» in recognition of the crucial role played by Juan de Valdés and the amazing popularity of the little treatise revised and spread by his disciples: the Beneficio di Cristo12. Use of this term «Valdesianesimo» to replace «evangelismo» has also entailed a significant revision in the traditional chronology, in which 1542 was long seen as the anno zero – marking as it did the flight into exile of Bernardino Ochino and the foundation of the Roman Inquisition. Instead, the 1540s are now regarded to have been a vital decade for the Valdes-inspired reformers, whose propagandistic activities continued during and even beyond the closing of the first phase of the Council of Trent13. Indeed, it cannot be emphasised enough how the years 1545-46 constituted the real watershed in that they marked the realisation that the one element which united the diverse agendas of the would-be innovators – namely the hope that through Pole the Council would recognise the Beneficio di Cristo as the means of reuniting the different forms of Christian experience – was not to be. The disappointment of this hope was the decisive turning point – doctrinal «Unklarheit» was replaced by a dogmatic clarity which was to be dramatised at the conclave of 1549 at which Gian Pietro Carafa played a crucial role in denying Pole the papacy. 6It is to these repressive efforts of Carafa and his lieutenants – or more precisely the historiography which has placed them very much in the foreground of recent scholarship – that I will shortly turn, since it is the current consensus amongst the majority of scholars that such was the ferocity (and ultimate success) of the reaction of the Roman Inquisition to the limited reforms introduced by those touched by evangelical ideas that it is perhaps more helpful to redirect attention away from attempting to trace in these initiatives a continuous narrative of «Riforma cattolica» and instead, on the one hand, to acknowledge the reality of repression over renewal («Controriforma») and, on the other, to look to an unfamiliar area of devotional practice for evidence of commonality between several Catholic Reformers, both spirituali and intransigenti: that of liturgical reform; to which I will devote the closing section of this chapter. 7It has long been a commonplace amongst historians to regard hindsight as simultaneously a gift and a curse. Even as we seek to know the past, we are condemned to remember the future. As essentially an historian of post-Tridentine religious culture, I have been made acutely aware of this problem during the writing of this contribution. For it is all too easy to emplot the narrative of internal Roman Catholic reform in terms of a story that, depending on your point of view, climaxes or finds its depressing resolution in the 1560s. One such narrative that has, until recently, enjoyed hegemonic status amongst historians of early modern Catholicism was that given its definitive formulation by Hubert Jedin in his 1946 article: «Katholische Reformation oder Gegenreformation?»14. As John O’Malley has shown with insight and sensitivity, Jedin never substantially changed his thinking on this matter. For the German scholar, Catholic religious renewal began with the uncoordinated efforts at self-reform of the church’s own members («Selbstreform der Glieder») in the fifteenth century before it received its more formal, institutional expression at the Council of Trent15. A succession of discrete initiatives internal to the Church, which began chronologically with the foundation of such lay brotherhoods devoted to caritas as those dedicated to St Jerome in the cities of Florence (1442), Vicenza (1494), Genoa (1497) and Rome itself (1515), where it is usually referred to as the Oratory of Divine Love, continued with the foundation of several new religious orders, all of which shared a determinately active apostolate focused on good works. These included: the Theatines in 1524, the Barnabites in 1533 (with its female wing: the Angelicals in 1530), the Ursulines in 1535 and the Somaschi in 1540 as well as the addition of a new, reformed branch of the Fransiscans: the Capuchins, in 1528. To such outcomes which, importantly for Jedin’s polemical purpose, could be dated and slotted into the continuous, narrative time-line called «Catholic reformation», he enumerated the necessarily more evanescent and isolated insights and contributions of various individuals. These comprised, inter alia: Gasparo Contarini’s anticipation of Luther’s «Turmerlebnis» as described in a letter to Paolo Giustiniani of 24 April 1511 and Contarini’s later, unsuccessful attempt to reach an understanding with the Protestant representatives at the Colloquy of Regensburg (1541); the curial and pastoral reform programme – the so-called Libellus ad Leonem decimum – put together by Paolo Querini and Vincenzo Giustiniani which was intended to influence the agenda of the Fifth Lateran Council and the diocesan reforms of Giovanni Matteo Giberti, bishop of Verona, whose chief legacy – as the prototype ideal model of the Tridentine bishop as resident pastor – was enshrined in the publication of the diocesan Constitutiones of 1542 and in the subsequent (delayed) appearance of Pier Francesco Zini’s sketch of the Bishop’s life, the Boni pastoris exemplum of 155616. 8This narrative was widely disseminated in volume four of the Handbuch der Kirchengeschichte (first published in 1967, which was translated into English as volume five on the Handbook of Church History in 1980), one of whose overall editors was Jedin himself. Although nuanced in its details over the course of three judicious chapters written by Marc Venard, the fundamental narrative: the «Unklarheit» of Catholic Reform tamed (and for Jedin saved) by the discipline of the Counter-Reformation remains essentially unchanged in the relevant volume of Histoire du Christianisme17. However, a particular merit of the latter, is the corrective emphasis which Venard places on reforming bishops from the Kingdom of Naples18. Here the role of Gian Pietro Carafa as Archbishop of the city was evidently of fundamental importance. His one time vicar general, the brilliant humanist Galeazzo Florimonte became successively bishop of Aquino and then of Sessa where he preached extensively and conducted visitations. Similarly, Pietro Tagliavia, Archbishop of Palermo (1544-58) resided in his archdiocese and, during his absence attending the Council of Trent, took care to appoint two vicars with special powers to visit and reform exempt monasteries. The momentum thus gained prior to the conclusion of Trent in 1563 bore fruit in the holding of a provincial council in Reggio Calabria already by 1565. In Trent’s immediate aftermath Giulio Pavesi, who had already worked tirelessly as vicar general of Naples, continued to display his reforming zeal as Archbishop of Sorrento and the Theatine prelates Giambattista Del Tufo, bishop of Mileto and Paolo Burali, archbishop of Naples set examples of pastoral care that bear respectable comparison (if not in absolute scale) with those which traditional Tridentine historiography has identified almost exclusively with the Milan of Carlo Borromeo19. The fundamental concept of reform found in these speeches is not one of aggiornamento, of up-dating or adapting to the times. Even the new laws which are to be enacted have as their intent a return to a former and allegedly more perfect state. This basic orientation backward is evident in the vocabulary of reform: restore, revive, recall, return, remove, reform, correct, cleanse and emend21. 10Perhaps inevitably, however, the Consilium de emendanda ecclesia, with its emphasis on the priesthood, its training and selection on the one hand, and on the confidence placed by its authors in papal authority and initiative to institute the necessary reforms, on the other, continues to be regarded, first and formost, as an overture to Trent22. Nevertheless, its significance for what follows is maybe to be found less in its content but more in its authorship. For the nine-man committee included, in Pole, Contarini and Carafa figures who were soon to be found on opposite sides of the debate over reform. Indeed, a reading of a private memorandum sent to Clement VII by Carafa on 4 October 1532 – that is to say four years before the Consilium was drafted – reveals just how intransigent in his views was the future Paul IV. Generally referred to as the Memorialaccio, the intemperate language of this document is noteworthy even by Carafa’s later extreme standards. In the opinion of the future-pope, it was absolutely necessary that heretics be treated as heretics and not negotiated with23. At the same time, bishops needed to be woken up to their urgent duty: the exercise of control over preaching, printing of books and behaviour in general24. Carafa then went on to say that such was the great number of sinners in the Church that is was necessary to focus only on those who were able to lead a holy life as an example to others25. 11Over the last two decades there has occurred an important historiographical development – one which might be referred to as «the inquisitorial turn» – which has revealed just how involved the protagonists themselves were in writing this story26. A leading figure here has been Massimo Firpo, whose massive contribution to our understanding of why the Italian Reformation took the form it did, has centred on his insight that the Roman Inquisition achieved its purpose not only through its repressive actions but also, importantly, by ensuring that the Holy Office became the historian and archive of the Roman Catholic church’s collective memory27. Under the indefatigable and ruthless direction of Gian Pietro Carafa and Michele Ghislieri; notably in the trials of Giovanni Morone, Pietro Carnesecchi and Vittore Soranzo – all of which have now been edited with correspondingly tireless and focused energy by Firpo (with the important archival collaboration of Dario Marcatto and Sergio Pagano) – the Holy Office sought to rewrite the history of sixteenth-century religious heterodoxy (and thereby redefine the terms of Roman Catholic orthodoxy) in order to justify and legitimise a policy which ensured that the Roman Catholic response to the Protestant reformation was papally directed from the centre with the Inquisition as «il vero motore della curia romana»28. 31 M. Firpo, op. cit. n. 27, p. 23. 32 H. Hillerbrand (ed. ), Oxford Encyclopedia of the Reformation, IV, p. 263-264. 12According to this interpretation, the Roman Catholic response to the protestant threat received its symbolic resolution not in the closing of the Council of Trent in December 1563 but in the public reading, which took place in the Roman Church of S. Maria sopra Minerva, of the sentence to death for heresy of the onetime secretary to Clement VII and intimate of Cardinal Pole, the Florentine protonotary Pietro Carnesecchi on 16 August 156729. Over the course of the two hours the sentence took to read out, the assembled audience (including over twenty cardinals) were given an extensive account of the accused’s complicity in heretical activity and his links with leading figures the length and breadth of the Italian peninsula over the previous decades, right back to the early 1540s. Indeed, such was the richness of Carnesecchi’s testimony that, according to Firpo, the Holy Office was even able to use it to reconstruct a compendium of the case against Carafa and Ghislieri’s real remaining target after the death of Cardinal Pole in 1558 – Giovanni Morone (this having been necessitated by the destruction of a good part of the archive of the Holy Office in the riots following the death of Paul IV in 1559)30. Although Carnesechi heroically refused to implicate Morone, even at the cost of torture and ultimately of his own life, his trials gave the Holy Office enough material concerning heretical activity in the Italian peninsula during the key period 154060 to enable the Inquisition to constitute itself: «in una sorta di archivio privilegiato della memoria storica della Chiesa controriformistica»31. As Paolo Simoncelli put it succinctly, a few years earlier, in his entry on Carnesecchi in the Oxford Encyclopedia of the Reformation: «In the end, it was not so much Carnesecchi on trial as the recent past of the Roman Church»32. Material from this inquisitorial archive was naturally deployed to demonstrate that it was only the Holy Office (not the deliberations of the Fathers at Trent), which had saved the Church from heresy and thereby laid the foundations for renewal. 33 M. Firpo, op. cit. n. 27, p. 27-28. 13For Firpo this discovery of the extent of the Holy Office’s conscious role as historian of the Church necessitates our final, complete abandonment of the Jedinian paradigm of change within continuity. There is now a need «di autonomizzare il più possible il rinnovamento cattolico postridentino dalla sfida protestante»33. This requires that we give full weight to the internal dimension of the Counter-Reformation as «una battaglia interna per il controllo delle coscienze, il disciplinamento sociale, la repressione del dissenso»; a battle which had as its protagonists, Contarini, Pole and Morone, on the one hand, and Gian Pietro Carafa together with his lieutenants such as Michele Ghislieri, on the other34. While I would be the first to concur with the judgement that Jedin did not understand the important role played by the inquisition in these decades, I am less sure that this «inquisitorial turn» in the historiography of the «Riforma italiana mancata», for all its fundamental contribution to our understanding, necessitates that we completely abandon Jedin’s thesis that Trent, and the changes it set in train, delivered the Roman Church from what would have otherwise been merely a Papal reformation by ensuring that the whole church was co-opted. My grounds for what some readers will undoubtedly regard as naively and wilfully optimistic adherence to an outdated narrative are centred on my provisional reply to the final question before us today: that relating to whether or not it might be said that there were any common projects between the Roman Catholic innovators in the Italian peninsula. 14Those familiar with my work will not be surprised when I answer in the affirmative and say that there was indeed a common project, which embraced the intransigenti as well as the spirituali, and that it took the form of the reform of worship. It is of course an irony of history that so-called Tridentine liturgy was not technically Tridentine at all; in that the decrees of the Council left it to papal initiative – specifically that of Carafa’s protégé Ghislieri as Pope Pius V, to see to the publication of the revised Roman Breviary and Missal in 1568 and 1570. A barrier to our proper understanding of this revised liturgy derives from its fate as the target of polemical attacks by champions of the reformed, vernacular worship of Vatican II, who have stereotyped the liturgy introduced after Trent by characterising it in terms of its rigid nature – Einheitsliturgie and rubricism are just two such dismissive labels. This has had the effect of removing it from history altogether, (indeed, one hostile commentator even refers to the Geschichtlosigkeit of Tridentine liturgy), when our understanding depends vitally upon its full historical contextualisation35. Elsewhere, I have attempted to demonstrate that its imposition was far from being a uniform process of standardisation directed from Rome, but rather involved a dialogue with local churches and religious orders, many of which continued to practice their particular devotions, most commonly by means of diocesan propers which were appended to the main texts of Roman breviaries (and have therefore, until recently, been largely invisible to historians)36. In this closing section to my chapter, however, I intend to focus on some of the initiatives taken before the publication of the so-called Tridentine liturgical books. 15These initiatives began not, as might be thought, with the famously successful Breviarium sanctae crucis (1535, 1536) of the Franciscan Francisco Quiñones, which was later proscribed by order of Paul IV in 1558, but with Clement VII’s brief Exponi nobis, founding the Theatine order in June 1524. In it the pope specifically empowered the Theatines to develop and use their own breviary, while a subsequent brief of January 1529 expressed papal satisfaction at the progress made and the hope that the forthcoming breviary would soon be available for public use. Although full documentary basis is lacking, it appears from Carafa’s own correspondence on the matter that the Theatine reform of the breviary was centred on awareness of the necessity of revising (rather than radically restructuring) its component parts in order to improve its role as a portable seminary for priests. This focused on the uncouth hymns (hymnos absonos) and, particularly, the hagiographical readings of doubtful accuracy and orthodoxy. As Carafa put it in a letter to Giberti of January 1533 in characteristically robust language: «[...] ma qual stomacho deve poter più sopportar tante sciochezze e sogni di libri apocriffi con tante bosie e tanta indignità che se chi ne havesse cura mai lo potria tolerar»37. In the event this critique did not issue in the publication of a new breviary; or at least not under the auspices of the Theatines. For we do know that as pope Carafa appointed suitably qualified people as advisers on the issue, several of whom were also members of the commission which eventually carried out the revision. This link between Carafa and the revised breviary also took the form of the pope’s own corrections, which we know came into the hands of the reforming commission38. And of the observation of cermonyes, begynnythe the very educatyon of the chylderne of God: as the old lawe doythe shewe, that was full of ceremonyes, whiche St Paule callythe pedagogiam in Christum41. 42 D. Fenlon, op. cit. n. 39, p. 92. Just as Basil in the fourth century had published his de spiritu sancto, emphasising sacramental regeneration as the work of the Holy Spirit, so now Pole and his circle in the sixteenth century sought to establish a liturgical lex orandi which would enable separated Christians to regroup within the communal lex credendi of the Church [...] What Pole believed was that if people could be persuaded to find Christ in the sacraments then they would find Him in the doctrine of the Church42. 18It is now over thirty years since Dermot Fenlon, in a truly seminal work, Heresy and Obedience in Tridentine Italy (1972), showed quite the degree to which Protestant theology was being debated at the highest levels of the Roman Catholic Church in the crucial decades of the 1530s and 1540s. The «inquisitorial turn» of recent years certainly enables us to appreciate more easily than ever before the challenge facing Cardinal Pole and others of similar mind (and the personal price they paid), as they tried to steer between heresy and obedience. But Fenlon has also, more recently, shown us how, for Pole, the message of the Beneficio di Cristo was to be understood within and expressed through an orthodox sacramental and liturgical framework, which in his last years as Archbishop of Canterbury he tried to give concrete expression to in England. I would venture to suggest that we are only beginning to work through the implications of this insight for the history of the Tridentine Church (and beyond). It is time now perhaps for a liturgical turn’ to lead the way and show us, inter alia, how obedience as an historical subject for study can be as rewarding as heresy. 1 H. de Lubac, Paradoxes of Faith, San Francisco, 1987, p. 145 cited in R. Williams, Why Study the Past? The Quest for the Historical Church, London, 2005, p. 6. 2 P. Polman, L’élément historique dans la controverse religieuse du xvie siècle, Gembloux, 1932; I. Backus, Historical Method and Confessional Identity in the Era of the Reformation (1378-1615), Leiden, 2003 (Studies in Medieval and Reformation Thought, 94). 4 J. Tedeschi (in association with J. M. Lattis), The Italian Reformation of the Sixteenth Century and the Diffusion of Renaissance Culture: A Bibliography of the Secondary Literature (ca. 1750-1997), Modena, 2000. 5 E. Gleason, On the Nature of Sixteenth-Century Italian Evangelism: Scholarship, 1953-1978, in Sixteenth-Century Journal, 9, 3, 1978, p. 3-25; S. Peyronel, Ancora sull’evangelismo italiano: categoria o invenzione storiografica, in Società e Storia, 18, 1982, p. 935-967; A. Jacobson Schutte, The Periodisation of Sixteenth-Century Italian Religious History: The Post-Cantimori Paradigm Shift, in Journal of Modern History, 61, 1989, p. 269-284 and G. Dall’Olio, La storiografia italiana sulla riforma in Italia, 1975-1997 in S. Peyronel (ed. ), Cinquant’anni di storiografia italiana sulla Riforma e i movimenti ereticali in Italia, 1950-2000, XL Convegno di studi sulla Riforma e sui movimenti religiosi in Italia (Torre Pellice, 2-3 settembre 2000), Turin, 2002, p. 37-60. I am most grateful to Dr Dall’Olio for sending me a copy of his article. 7 S. Seidel Menchi, Erasmo in Italia 1520-1580, Turin, 1987, passim (for the term «teologia del quotidiano» see ibid. p. 92-93). Cfr. Dall’Olio, op. cit. n. 5, p. 46-47. 9 See for this theme most recently: O. Niccoli, Rinascimento anticlericale: infamia, propaganda e satira in Italia tra Quattrocento e Cinquecento, Rome-Bari, 2005. 10 J.-F. Gilmont (ed. ), La Réforme et le livre: L’Europe de l’imprimé (1517v.1570), Paris, 1990. In the essay on Italy by S. Seidel Menchi (p. 327-74) there is a useful list of Italian translations of Northern Protestant writings during the period 1525-66 (p. 355-60). 11 To the monks: «the debate whether man was justified by grace alone, or by grace with works – the irreconcilable antithesis of the conflict – was wrongheaded; it arose from the forensic obsessions of late-medieval theology, missing the true nature of salvation taught by Paul and explained by Chrysostom. The Benedictine monks [...] held that free will and works were necessary, not for merit, but as a means of restoring human nature, so that there was no conflict between gratia sola and opera humana [...].» B. Collett, Italian Benedictine Scholars before the Reformation: the Congregation of Santa Giustina of Padua, Oxford, 1985, p. 27. On the Congregation’s failure at Trent see ch. 9. 12 M. Firpo, Riforma protestante ed eresie nell’Italia del Cinquecento: un profile storico, Bari/Rome, 1993, p. 89-93. Cfr. B. Collett, op. cit. n. 12, p. 183-85. 13 M. Firpo, Il «Beneficio di Cristo» e il concilio di Trento (1542-46) in C. Mozarelli and D. Zardin (ed. ), I Tempi del Concilio: religione, cultura e società nell’Europa tridentina, Rome, 1997, p. 225-252. 14 H. Jedin, Katholische Reformation oder Gegenreformation? Ein Versuch zur Klärung der Begriffe nebst einer Jubiläumsbetrachtung über das Trienter Konzil, Lucerne, 1946, p. 7-38. These pages are now available in English translation in D. M. Luebke (ed. ), The Counter-Reformation: The Essential Readings, Oxford, 1999, p. 21-45. Cfr. the illuminating discussion in J. W. O’Malley, Trent and All That: Renaming Catholicism in the Early Modern Era, Cambridge (Mass. ), 2000, esp. p. 46-71. 15 The reforming credentials of the fifteenth-century episcopate in Italy, as exemplified in the actions of Ermalao Barbaro (c. 1410-71) at Verona, Niccolò Albergati (c. 1375-1443) at Bologna and Antonino Pierozzi (1389-1459) at Florence, have recently been reaffirmed by scholars such as D. S. Peterson in his survey chapter Religion and the Church in J. M. Najemy (ed.) Italy in the Age of the Renaissance, Oxford, 2004 (Short Oxford History of Italy), p. 73. 16 Even more delayed was the publication of Gasparo Contarini’s treatise: De officio viri boni et probi episcopi. This was written as early as 1517, but did not appear in print until the (censored) Paris edition of 1571. See G. Fragnito, Aspetti della censura ecclesiastica nell’Europa della Controriforma: l’edizione parigina delle opere di Gasparo Contarini, in Rivista di storia e letteratura religiosa 21, 1985, p. 3-48. A reliable Latin text with facing, English translation is now available: G. Contarini, The Office of a Bishop, tr. J. P. Donnelly, Milwaukee, 2002. 17 J.-M. Mayeur et al. (ed. ), Histoire du Christianisme, VIII. Le temps des confessions (1530-1620), Paris, 1992, part I, ch. 5; part II, 4 & part III, ch. 3. Interestingly, the relevant volume of the forthcoming Cambridge History of Christianity (VI. Reformation and Expansion 1500-1660) appears to duck the issue altogether by omitting any chapter specifically dedicated to Roman Catholicism pre-Trent. 18 J.-M. Mayeur et al. (ed. ), Histoire du Christianisme, VIII, p. 529-533. Cfr. G. Alberigo, I vescovi italiani al Concilio di Trento (1545-1547), Florence, 1959 and C. Russo, L’attività riformatrice di Giulio Pavesi, arcivescovo di Sorrento, Sorrento, 1956. 19 For a useful conspectus of the state of the Church in this neglected area see G. De Rosa & A. Cestaro (ed. ), Il Concilio di Trento nella vita spirituale e culturale del Mezzogiorno tra xvi e xvii secolo, Venosa, 1988. 20 R. Bireley, The Refashioning of Catholicism 1450-1700, Basingstoke, 1999, p. 21. By contrast, predictably volume four of the Handbuch der Kirchengeschichte begins at 1517 with Martin Luther. 21 N. Minnich, Concepts of Reform Proposed at the Fifth Lateran Council, in Archivum historiae pontificiae, 7, 1969, p. 163-251 (quote at 233). 22 For the Latin text see S. Merkle et al. (ed. ), Concilium Tridentinum: Diariorum, actorum, epistolarum, tractatuum nova collectio, XII, 2nd edition, Freiburg, 1966, p. 131-145. For a recent example of its insertion into a narrative of reform which climaxes at the Council of Trent see John C. Olin, Catholic Reform from Cardinal Ximenes to the Council of Trent 1495-1563: An Essay with Illustrative Documents and a Brief Study of St Ignatius Loyola, New York, 1990, p. 65-79. Cfr. the judgement of Venard: «Mais c’était un texte courageux, qui faisait espérer que Rome allait s’engager résolument dans la voie de la réforme.» Histoire du Christianisme, VIII, p. 234 and the remark of Michael Mullett: «Far from threatening the papacy as an institution, as conciliar reformists in the past had sometimes appeared to do, the Consilium paved the way for papal direction of Catholic reform in the sixteenth century by putting its confidence in the Holy See to renew the Church [...]», in M. A. Mullett, The Catholic Reformation, London-New York, 1999, p. 35. 23 «[...] li heretici si voleno trattare da heretici e lo humiliasse Sua Sta a scrivere o a parlar loro blandamente [...]» G. P. Carafa, De Lutheranorum haeresi reprimenda et ecclesia reformanda ad Clementem VII (BAV, Barb. lat. 5697, fol. 1r-10r) printed in Concilium Tridentinum, XII, p. 67-77 (quote at 68). 24 «E però bisogna che Sua Sta provedesse parte con excitar li ordinarii che per tutto quasi si dorme.» Concilium Tridentinum, XII, p. 69. 25 «Et s’alcun dicesse: ergo reformarsi tutta la detta congregatione, dico che questo ad ogni humana potentia è simpliciter impossibile per la grand moltitudine di pessimi subjetti che ci son dietro, li quali tengono talmente oppressi li boni che in nulla cosa si lassano valere, et è tanta la discordia che nasce dalla diversità della vita e costumi che nelli cattivi causa inimicitia et odio parricidiale [...] questa unica et diritta via di riformar: cioè di ridursi et ristringersi a quelli pochi li quali fossero et ferventi a voler et apti a seguitar la bona vita et poi con la luce de gli essempi di coloro hanno excitato anchora la moltitudine de gli altri a far bene e lassando gli altri ordini.» Concilium Tridentinum, XII, p. 74-75. 26 The following is necessarily an extremely selective list and represents just those titles which the present writer found useful when tracing the development of this rich vein of historiography: M. Firpo, Il primo processo inquisitoriale contro il cardinal Morone (1552-53), in Rivista storica italiana, 93, 1981, p. 71-141; A. Del Col, I processi dell’Inquisizione come fonte. Considerazioni diplomatiche e storiche, in Annuario dell’Istituto storico italiano per l’età moderna e contemporanea, 35-36, 1983-84, p. 31-49; S. Seidel Menchi, Inquisizione come repressione o inquisizione come mediazione? Una proposta di periodizzazione, in Annuario dell’Istituto storico italiano per l’età moderna e contemporanea, 35-36, 1983-84, p. 53-77; P. Simoncelli, Inquisizione romana e riforma in Italia, in Rivista storica italiana, 100, 1988, p. 5-125; D. Solfaroli Camillocci, Le confraternite del divino amore: interpretazioni storiografiche e proposte attuali di ricerca, in Rivista di storia e letteratura religiosa, 27, 1991, p. 315-332; A. Prosperi, Tribunali della coscienza, Turin, 1996; G. Fragnito, La bibbia al rogo, Bologna, 1997; M. Gotor, I beati del papa, Turin, 2002. 27 See, for example, Firpo’s remarks on how the questions in the trials against Pietro Carnesecchi were constructed: «non tanto per accertare colpe e complicità ormai comprovate, quanto per ricostruire in tutte le sue articolazioni il grave pericolo di contagiare d’eresia il vertice e il corpo tutto dell’istituzione ecclesiastica [...] un modo, questo, di utilizzare l’Inquisizione e la documentazione processuale conservata nei suoi archivi anche come chiave di lettura privilegiata per ricostuire e capire la storia di quei decenni tumultuosi.» M. Firpo, Inquisizione romana e Controriforma: studi sul cardinal Giovanni Morone (1509-80) ed il suo processo d’eresia, 2nd enlarged edition, Brescia, 2005, p. 23. 28 M. Firpo, Inquisizione romana e Controriforma, p. 24. Cfr. Paolo Simoncelli’s assessment of its significance in a review article: «[...] dopo questi volume non si potrà fare più storia della Riforma e Controriforma in Italia come si poteva fare prima dell’edizione [...]» in Del processo Morone, in Archivio storico italiano, 148, 1990, p. 427-448, (quotation at 430). 29 As recounted in M. Firpo and D. Marcatto, I processi inquisitoriale di Pietro Carnesecchi. Edizione critica, Vatican City, 1998-2000, II, 1, p. CXXXV. 30 Cfr. Carnesecchi’s own testimony of 15 December 1566: «[...] la principal causa che inducesse la santa memoria di Papa Paolo quarto ad inquirirmi et citarmi fusse la speranza di dovere, per mezzo mio intendere delle cose per le quale havesse potuto condennare il Cardinale d’Inghilterra [Pole] et Morone.» See M. Firpo and D. Marcatto, I processi inquisitoriali di Pietro Carnesecchi, vol. II, 2, p. 660. 34 M. Firpo, Il Cardinal Giovanni Morone (1509-80) tra riforma e controriforma, in Bollettino storico per la provincia di Novara, 84, 1993, p. 27-47, reprinted in M. Firpo, op. cit. n. 27, p. 35-53 (at 47). 35 For «Einheitsliturgie» see T. Klauser, A Short History of the Western Liturgy: An Account and Some Reflections, Oxford, 1969, p. 117 s. For the description «Geschichtlosigkeit» see J. A. Jungmann, Pastoral liturgy, Tenbury Wells, 1962, p. 80-89. 36 The initial analysis in my monograph: Liturgy, sanctity and history in Tridentine Italy, Cambridge, 1995, (p. 19-43) has been subsequently elaborated in the following essays: Giving Tridentine Worship Back Its History in R. N. Swanson (ed. ), Continuity and Discontinuity in Christian Worship, Woodbridge, 1999 (Studies in Church History, 35), p. 199-226; Il papa pastore? Pio V e la liturgia in M. Guasco & A. Torre (ed. ), Pio V nella società e nella politica del suo tempo, Bologna, 2005, p. 159-178; and Tridentine Worship and the Cult of Saints in R. Po-chia Hsia (ed. ), Cambridge History of Christianity VI: Reformation and Expansion, 1500-1660, forthcoming. An essential, if necessarily incomplete, census of proper offices retained by dioceses and religious orders may now be found in R. Amiet, Missels et Bréviaires imprimés (supplément aux catalogues de Weale et Bohatta); Propres des Saints (édition princeps), Paris, 1990. 37 BAV, Barb, lat. 5697, fols 35r-37v (quotation at fol. 37r). Cfr. G. M. Monti, Ricerche su Papa Paolo IV Carafa, Benevento, 1935, p. 147-54. 38 S. Ditchfield, Liturgy, sanctity and history, p. 29. Cfr. P. Battifol, History of the Roman Breviary, London, 1912, p. 96-97. 39 A. Prosperi, Tra Evangelismo e Controriforma, G. M. Giberti (1495-1543), Rome, 1969, p. 219-220, 228-229 and 272. Cfr. D. Fenlon, Pole, Carranza and the Pulpit, in J. Edwards & R. W. Truman (ed. ), Reforming Catholicism in the England of Mary Tudor: The Achievement of Friar Bartolomé Carranza, Aldershot, 2005, p. 81-97. 40 D. Fenlon, Heresy and Obedience in Tridentine Italy. Cardinal Pole and the Counter-Reformation, Cambridge, 1972, p. 256. For Pole’s role, together with Contarini, in facilitating Giberti’s publication of Opera quaedam Beati Basilii Caesariensis Episcopi, Venice, 1535, see A. Prosperi, Tra Evangelismo e Controriforma, p. 228-229. 41 J. Strype, Ecclesiastical memorials relating chiefly to Religion and the Reformation of it, and the emergencies of the Church of England under King Henry VIII, King Edward VI and Queen Mary with large appendixes, containing original papers, records &c, vol. III, part II, Oxford, 1822, p. 482-510 (at 502). For this reading I am indebted to D. Fenlon, op. cit. n. 25. Cfr. the judgement of E. Duffy: «In this emphasis on the positive value of ceremony and sacrament, Pole and his colleagues, so often accused of lacking a grip on the realities of mid-Tudor England, were certainly more closely in tune with the feelings of the laity at large than were the reformers.», The Stripping of the Altars: Traditional Religion in England, 1400-1580, New Haven, 1992, p. 531. DITCHFIELD, Simon. Innovation and its limits: the case of Italy (ca. 1512-ca. 1572) In : La Réforme en France et en Italie : Contacts, comparaisons et contrastes [en ligne]. Rome : Publications de l’École française de Rome, 2007 (généré le 20 avril 2019). Disponible sur Internet : <http://books.openedition.org/efr/1729?nomobile=1>. ISBN : 9782728310197. DOI : 10.4000/books.efr.1729. Ditchfield, Simon. “Innovation and its limits: the case of Italy (ca. 1512-ca. 1572)”. 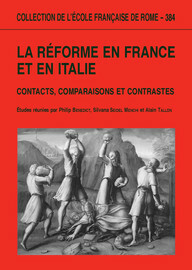 Benedict, Philip, et al.. La Réforme en France et en Italie : Contacts, comparaisons et contrastes. Rome : Publications de l’École française de Rome, 2007. (pp. 145-160) Web. <http://books.openedition.org/efr/1729?nomobile=1>.